Ear Candles for Sale by AJS Naturals - Made in USA, Since 1994. All Orders Shipped by USPS 2-3 Day Delivery Priority Mail. Free Shipping Available. Since 1994, AJS Naturals has been making ear candles utilizing a formula and technique that was passed down by family. Our formula simply uses highly purified beeswax that is uniquely infused with food grade paraffin. This blending technique is a family secret that creates a great performing ear candle. The formula produces a consistent burn rate and creates a comfortable burn temperature. In producing our ear candles we utilize a special molding technique to reduce wax buildup. This process results with an ear candle that has very little interior and exterior “wax” surface buildup. This helps make a safe and more pleasurable ear candling experience. Compared to other ear candles, the excessive wax buildup is very noticeable. We also use a special type of muslin to produce ear candles. 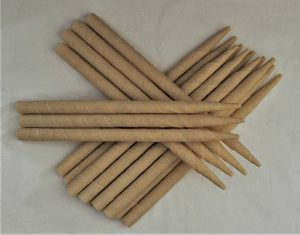 Of all the grades of muslin, only one will give you the sturdiness and bonding characteristics that create the type of ear candle we look to produce. We strive to make quality ear candles that provide results. When using our ear candles you will experience a feeling of warmth and a relaxing sensation of enjoyment. This experience along with results is what our customers enjoy and expect. For more about the ear candling experience, please find time to read the following article published by “The New York Times”. Notice that our ear candles have uniformity. Ear Candle Length: 10 1/2 to 11 1/2 inches; 1/2 inch interior diameter barrel that tapers down to an adjustable 1/8 inch diameter open tip. No plastic insert is installed in the tip of our ear candles. Our ear candles are made with filtered clean pure beeswax, infused with food-grade paraffin. And quality grade unbleached muslin material. The burn time per ear candle will vary depending on the local climate and elevation. But in most cases, each ear candle will take approximately 10 to 15 minutes. SHIPPING INFORMATION: All USA orders will be shipped by the US Postal Service utilizing Priority Mail / 2-3 day delivery. For International orders Priority Mail or First Class Mail will be utilized. For more information refer to Shipping Policies. The Combination Option is no longer available due to the potential of order errors. For this reason where multiple scented ear candles are needed please place those as individual separate scented orders chosen from the available amounts. Two Hundred (200) count - Ear Candles sealed in a 3 mil plastic bag. Choose from available scents: Unscented, Tea Tree, Lavender, Rose, and Eucalyptus. Three Hundred (300) count - Ear Candles sealed in a 3 mil plastic bag. Choose from available scent: Unscented, Tea Tree, Lavender, Rose, and Eucalyptus. Five Hundred (500) count - Ear Candles sealed in a 3 mil plastic bag. Choose from available scent: Unscented, Tea Tree, Lavender, Rose, and Eucalyptus. Monday Through Friday Except Major Holidays and Occasional local Sale Deliveries. Online Orders always accepted. Statements made about specific product(s), procedures or other items sold on or through this website have not been evaluated by the US Food and Drug Administration. They are not intended to “diagnose, treat, cure or prevent disease.” The information on this site is for informational purposes only.